The first time I came across military LEGO was in a NEWS item about a man who had built a massive US warship all to scale in his rather large garage\shed\man cave. I was extremely impressed and I think at that moment fell in love with military LEGO. So when it came to deciding what I'd like to cover on the blog what we shall call from now on MiniFigs was a no brainer. I just needed to get those hives of creativity the builders and sellers to come on board. Thankfully all those I contacted agreed, paving the way I hope to a successful and popular section of the blog. The first MiniFigs to stand to attention and get reviewed is a selection from Little-Legends. Each figure came in it's own packaging which unusually was pretty easy to open up to get to the little MiniFig with in. First up is 'Tactical Team - Rumbler - Custom Figure'. What struck me was the superb quality of the MiniFig. 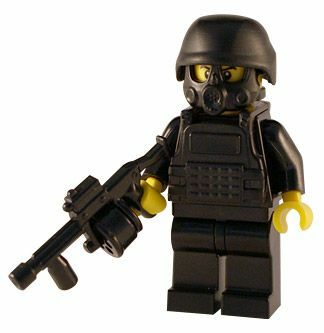 Though I wouldn't normally buy a SWAT MiniFig I fell in love with it straight away. The detail in the Gas Mask and Body Armour is excellent and really can't be faulted. On his back he even has a detachable Hydration Pouch, now I've no idea what a Hydration Pouch is except it hydrates (probably) I still think it's uber cool. He comes fully armed with a Grenade Launcher which again smacks of quality. Now I have heard people show surprise at the cost of these MiniFigs, but I'll say now they are worth every penny. Plus it's very unlikely this sort of thing will go down in price and over time I expect it to start becoming a little investment as figures go out of production. personally the mix of my interest in the military coupled with nostalgia is to much of a potent mix to let it pass buy. 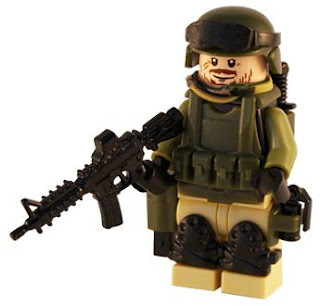 'Tactical Team - Rumbler - Custom Figure' retails at £10.95. Next up comes 'Renegade - Custom Army Minifig'. Here we have another treat with a MiniFig jam packed with his tools of the trade. As you can see from the pic he looks amazing and you have to admire the attention to detail that's gone into him. He comes wearing Body Armour, a Tactical Belt, Knee Pads, Modern Combat Helmet, Camo Scarf and Goggle cover. What more could a MiniFig need!? Well weapons obviously and he doesn't fall short here either. He packs an Assault Rifle, a mean looking Knife in a sheath, Pistol in a holster and last a Smoke Grenade in easy reach! What else can I say about him? Pure quality and will enhance any MiniFig collection or diorama! 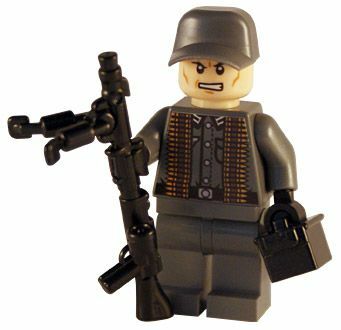 Finally we have a WWII Minifig 'WW2 - German Gunner - Custom Minifig'. This little chap not only comes with his HMG but also a spare Ammo Box and enough ammo around his neck to put the fear into any Russian platoon that comes into his sights! He also sports his M41 Field Cap. Plus his HMG has a movable bipod. No WWII MiniFig diorama will be complete without this little chap and his 'Bone Saw'! Again detail is faultless, just first rate quality MiniFig like the other two. Well that's it for the first lot. 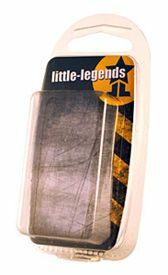 I'm looking forward to the next selection from Little-Legends!